How important is protein in our diets and how much should I be consuming? It is involved in so many different functions and processes in the body. OF ALL THE macronutrients, none has been endowed with more qualities than protein. Even the “protein” itself is derived from the Greek word “proteus” meaning the first or most important one. Protein is undoubtedly important and involved in so many different functions and processes in the body. In saying that, there has been a huge push in recent years for products containing protein. So let us now take a balanced look at the different types, why it plays an important role in our diet and achieving our goals and how much we actually need on a daily basis. Protein is a collective of about 20 different amino acids classified as “essential” and “nonessential”. Nine are classified as essential. What that means is that our body is unable to manufacture them. Ideally, we need a full range of amino acids for different reasons. Animal proteins like meat, chicken, fish and eggs contain the full range of essential and non-essential amino acids, thus these are classified as “complete of high quality” proteins. What people may not realize is that protein is also present in fruit, vegetables, salad leaves, grains, beans, lentils and legumes. We nearly always associate protein with meat and are not aware that we can get all the protein we need from a healthy range of fruit, vegetables, grains and legumes. There are many different types of protein which are now for sale in powder form. Essentially these different types are absorbed at different rates in the body. 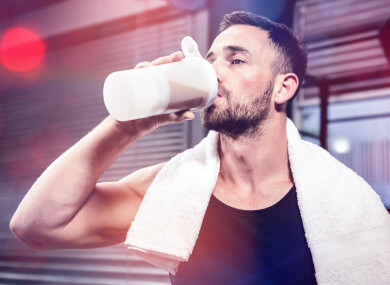 So whey protein which is derived from milk, is absorbed into the blood stream very fast (usually about 20 minutes) to something like casein which takes hours to hit the bloodstream. Then there are other types of protein which fall somewhere in between. So directly after a workout, people consume whey protein and maybe at night people consume casein to help build muscle as growth hormone is released by the pineal gland in the deep part of sleep. Protein sourced from foods will take longer to hit the bloodstream. We are however designed to digest and assimilate all the amino acids from different foods naturally. The cleanest sources would be beans, lentils and legumes along with grains and vegetables. The only grain to contain all nine essential amino acids is quinoa. Protein from meat sources and eggs carry saturated fats which can encourage fat storage and high cholesterol. Again, a balanced diet containing a variety of foods is best. When we exercise we damage muscle fibres. Micro-tears occur in the muscle tissue and these need to be repaired. Depending on the amount, the body will rebuild the muscle fibre bigger and stronger. People take protein supplements to help with this. Generally, a few things need to happen to help repair. As we exercise our bodies are breaking down muscle — this is known as catabolism. We are in a catabolic state. The amino acids may be used to create new energy (gluconeogenesis). Once we have finished exercise we want this breakdown to stop and rebuilding to start. This rebuilding is known as protein synthesis. Before the repair process occurs, certain things need to happen. A hormone called insulin or IGF-1 needs to be produced in order to signal growth and amino acids need to be present in the bloodstream. That is why we need to eat carbohydrates and protein following a workout. Research tells us that this anabolic or rebuilding phase will last for about two hours in the body no matter how much protein we eat. Then blood amino levels drop and we rest. After 3-4 hours or another change in amino acid levels in the blood, the rebuilding starts again and this usually maintains for 24-48 hours. Of course, the type of exercise you are doing will dictate the type of body, unless and machine you are building. So, a bodybuilder will require a lot more protein than a long-distance runner. There are many factors determining how much you should take. This the total daily amount. You must remember that you are getting protein from your food as well. A chicken breast typically contains about 20 grams of protein. A cup of brown rice contains 5 grams and even a full head of romaine lettuce has about 8 grams. The truth is that you won’t need to supplement that much. My best advice to those who wish to gain muscle mass is as follows. The important number is your overall daily amount of protein. Remember you need to take in carbohydrates to start protein syntheses. Finally, and probably most importantly — most building and tissue repair occurs when you sleep. If you want to build muscles get casein or drink milk-based products before bed. During the first two deep phases of sleep, growth hormone is being pumped out of your body signally rebuilding. For those wishing to get lean. Firstly, protein does not burn fat — exercise does. The easiest way to get lean is cut down on refined fats and oils. Do lots of High Intensity Interval Training (HIIT). Eat lots of nutrient dense foods like salads, vegetables and berries and use protein to kill appetite. Protein signals our body to reduce the production of the hormone Ghrelin — “the hunger hormone”. So, having some protein with our meals helps dampen the appetite and kill cravings. In terms of how much you should take in a meal or shake, research indicates there was very little difference between taking 25g of protein and 40g of protein. You cannot store it in the body for very long (blood amino acid levels and actual muscle is the only way to store it) so taking it at regular intervals works best. Email “How important is protein in our diets and how much should I be consuming?”. Feedback on “How important is protein in our diets and how much should I be consuming?”.